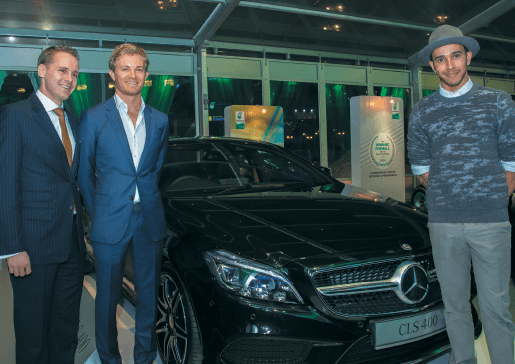 LAST WEEK, Lewis Hamilton and Nico Rosberg were the special guests of an intimate dinner hosted by Mercedes-Benz a few days ahead of the Petronas Malaysia Formula 1 Grand Prix. At the dinner, held at the Symphony Lake Suite at KLCC Park, the two youthful drivers of the Mercedes AMG team took turns being photographed with guests and the other star of the night, the new generation CLS 400 coupé. Indeed, the Mercedes AMG team have much to celebrate — they completed the 2014 season 296 points ahead of their closest rival Red Bull Racing in the Constructors’ World Championship standings, with Hamilton and Rosberg taking home the drivers champion and pole trophy respectively. At the dinner, vice-president of Mercedes-Benz cars Mark Raine proudly unveiled the statistics. “The year 2014 has been an incredible year for Mercedes-Benz. Not only being crowned the Formula 1 World Champion but with two of our Formula 1 legends we have accumulated a total of 16 wins, 18 pole positions, 12 fastest laps and 31 podium finishes,” he said in his welcoming speech. At the race in Sepang last week, the pole position went to a very tenacious Sebastian Vettel in his inaugural season for Ferrari, with Hamilton and Rosberg joining him on the podium in the second and third positions. Despite being aware of the challenges that lay ahead of them — the circuit in Sepang is known to be one of the toughest — the two drivers were in excellent spirits and eager to meet and greet their fans that night at a relaxed event marked by a tasteful, elegant and iconic setting. In a lakeside pavilion in full view of the twinkling lights of Suria KLCC, long white tables and ivory chairs were given splashes of life by way of artful floral centrepieces in the Mercedes AMG team’s colours of white and green, lit candles nestled in vintage-inspired jewellery boxes and gleaming yellow cubes of butter on creamy white dishes. Tasteful placards on soft white plates indicated who would sit where, with the most coveted seats being near the two drivers, of course, and those closest to the new car. Unveiled for the first time, the new CLS 400 brings fascinating details and captivating style to new heights with details like a new diamond grille as well as dynamic and sensuous front headlights. The CLS range was actually launched 10 years ago to combine the elegance and dynamism of a coupé with the comfort and functionality of a saloon. The new coupé continues to do this with its sporty interiors, exceptional design language and high-technology advances that is an ode to modern automotive luxury. Those who were satisfied with admiring the breathtakingly beautiful new CLS, positioned right next to the actual F1 cars that Hamilton and Rosberg had raced last year, were soon spotted admiring a display by the other partners of the Mercedes AMG team — pieces from IWC’s Ingenieur collection was on display alongside a showcase of some of Tumi’s most interesting bags from the spring/summer range. The tasteful and simple dinner menu perfectly matched the elegance of the setting — a cool seared scallop to start, a smooth and satisfying pumpkin veloute and the option of seared cod, grilled beef cheek or mushroom ravioli for the mains. Dessert, a startlingly delightful white chocolate mousse with a melting mango pudding hiding within, was the best part of all because of what it was timed with — a performance by jazz chanteuse Datuk Sheila Majid. The ageless and beautiful singer, hailed as Malaysia’s own queen of jazz, sang a delightful medley of Stevie Wonder hits before performing a rousing rendition of Sinaran, one of her best-known songs that had everyone singing along. When Sheila took her final bow the night was far from over, leaving guests to continue the merrymaking well into the night — all in the name of Mercedes-Benz and the excitement and glamour of F1 racing. This article first appeared in The Edge Financial Daily, on March 31, 2015.